Most Americans at home willingly made sacrifices for the war effort but others resorted to cheating and Black Market activities. 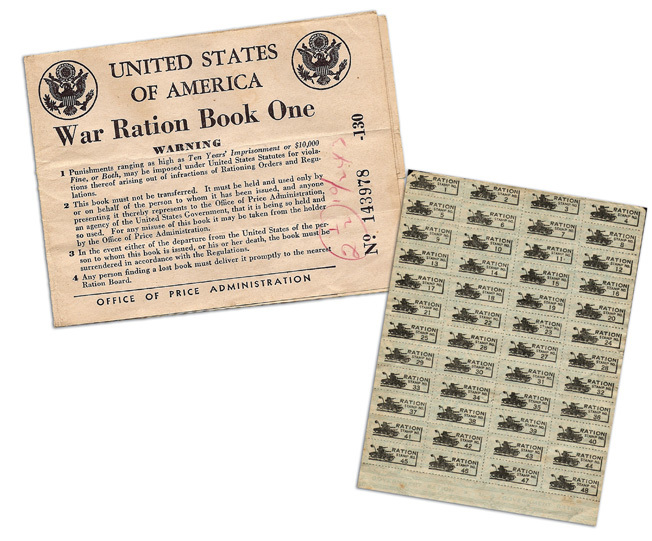 Rationing struck the American public in 1942. It arrived with force and uncertainty and generated an economic crisis that could have caused America to lose the war. It came originally on August 28, 1941, without the approval of the United States Congress. The Office of Price Administration (OPA), which administered rationing during World War II, was established within the Office for Emergency Management by President Franklin Roosevelt’s Executive Order 8875. The OPA’s initial function was to stabilize prices (price control) and rents as the U.S. government readied for America’s certain involvement in World War II. From this beginning, the OPA’s economic power soon grew mighty. The OPA became an independent agency under the Emergency Price Control Act, a law passed by Congress and signed by President Franklin Roosevelt on January 30, 1942. The organization was given the authority to place ceilings on all prices except agricultural commodities. It could ration virtually everything else, including tires, gasoline, and new automobiles, as well as such consumer items as sugar, coffee, shoes, silk stockings, meats, perfumes, and processed foods. The OPA didn’t wait to exercise the power it knew it would be handed. Richard Lingeman reports in Don’t You Know There’s a War On? 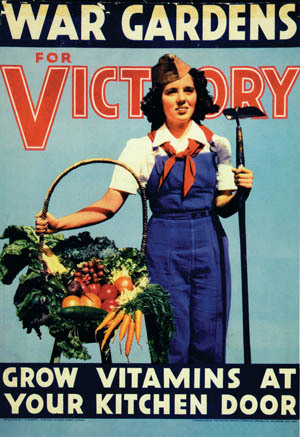 The American Home Front 1941-1945, that the OPA “got itself into the rationing business by ordering, on its own initiative, a tire-rationing plan.” The program went into effect on December 30, 1941, and was fully active in January. The strife and turmoil commenced even before the OPA was formally activated. It began with a rubber crisis but rapidly expanded outward into gasoline. Whether the OPA had been legal in acting on its own in regard to tire rationing, the fact remained the government desperately needed tire rationing to begin at once. 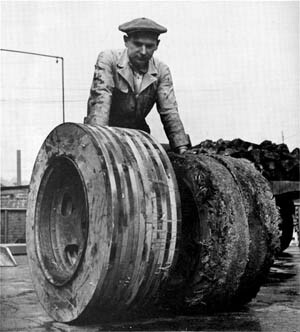 Just 660,000 tons of crude rubber had been stockpiled as opposed to an annual U.S. consumption of between 600,000 and 700,000 tons; the War Department saw its rubber stockpile rapidly vanishing. Japan’s seizure of vast rubber plantations during its conquests in the Malay Peninsula (southwest Thailand, western Malaysia, and the island of Singapore) and the Dutch East Indies (Indonesia) in early 1942 made the situation even more critical by cutting the sources to nearly 90 percent of America’s natural rubber supply. After the OPA clamped down on the sale of tires, it followed with a ban on tire recapping and a shocked American motoring public of some 30 million drivers was slammed with an initial taste of what life under rationing would be like. Few drivers were allowed to obtain certificates to purchase new tires, and anyone who owned more than five tires was ordered to turn over the “extras” to his or her local gas station. While some drivers complied, others did not, and still others paid exorbitant prices for tires, doing this without concern about the government’s regulations or where the tires came from. A mechanic shows off two pairs of hardwood tires—the pair on the left is new while the other has been driven 500 miles. Restrictions of the sale of new cars came next. This began on January 1, 1942, when a freezing order banning the sale of all new cars went into effect until a rationing program could be worked out. This program was to be made public by January 15, but that date was quickly pushed back to an unspecified date in February. However, on January 14, 1942, the government ordered the stockpiling of all cars shipped after January 15. Cars shipped to dealers could not be sold until specific permission was granted—if this permission was deemed “in the public interest.” The January 14 stockpiling order was followed a month later with a government order that placed all new cars in stock into long-term storage. Various desperation-measure rubber-collection drives were tried, but the shortage remained critical while Roosevelt continued to hesitate even as work began on building synthetic-rubber plants. Finally, the president was forced into action. Gas rationing for the 17 states in the eastern United States was announced at the beginning of May; as might be expected, it set off a storm of opposition before going into effect on May 15, 1942. While the struggle over eastern states’ gas rationing continued unabated, the OPA went ahead with rationing and the issuing of ration books for the entire United States. Dr. Wilson was wrong. There were “serious problems” and the outlook was grim. Wilson had omitted both the transportation of oil and German submarines from his thinking. Before the war, the eastern oil refineries depended on tanker delivery for 95 percent of their oil; many tankers sailed along the Gulf Coast from ports in Texas, Mississippi, and Louisiana and then up the East Coast to their various destinations. However, with the start of the war, German submarines, operating alone or in wolf packs, began sinking a great many American or American-leased tankers sailing this route. The government solution was to link the rich Texas oil fields with the northeastern states through the construction of the Big Inch—a 24-inch pipeline beginning at Longview, Texas, and eventually extending to various refineries throughout the eastern United States. Gas rationing was urgently needed because the first stage of the Big Inch was not scheduled to be completed for another year. In spite of an obviously desperate situation, gas rationing was met by powerful protests from within Roosevelt’s cabinet as well as by outrage from the big oil interests when they heard details of the rationing plan. The government limited motorists to between 2.5 and five gallons of gasoline per week. Harold L. Ickes, Roosevelt’s secretary of the interior as well as his petroleum coordinator, slammed the rationing plan as “half-baked, ill-advised and hit or miss.” Many oil executives claimed East Coast gas rationing did nothing more than set the stage for future nationwide rationing. Powerful oil interests organized a propaganda campaign against East Coast rationing and on the May 10 weekend, the last weekend before rationing went into effect, over 200 members of Congress asked for and received X cards, which allowed the bearer unlimited purchase of gasoline. However, for senior American planners, the issue was not only corporate greed, although that was bad enough. The main issue was America’s economic and military survival. Would America’s drivers have enough gasoline to go to and from work and, if not, what would this do to them, the economy, and the war effort? The situation was a government nightmare. 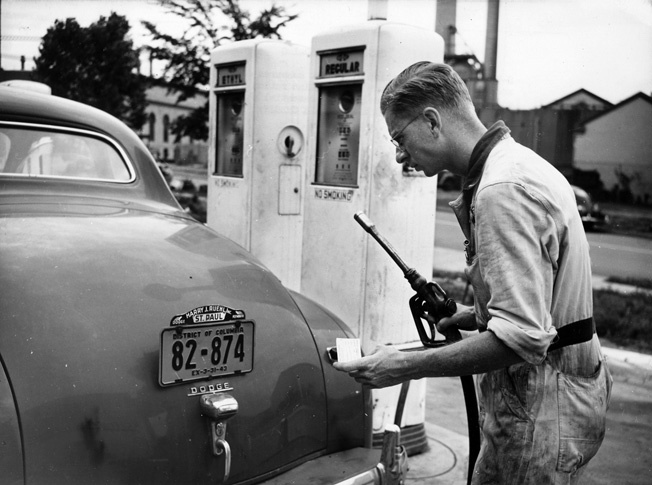 A service station attendant measures out the precious fluid in accordance with OPA’s A gasoline ration books, July 1942. The government discovered a painful truth as many people in the eastern United States seethed in anger and did their best to break the gas rationing rules. If rationing was to work, the same rules would have to be applied equally all across the country. However, as May 1942, ended with Roosevelt still waffling over nationwide gas rationing, the OPA had frozen or was readying to freeze the prices on practically everything. Virtually all consumer goods were either rationed or soon would be. Sugar would be rationed first and coffee would soon follow. The plan had obvious flaws, the most obvious being that many board members knew the applicants personally, and some were even relatives. However, even with this, rationing soldiered on. The OPA had originally planned to issue five ration books but finally issued only four. The first page of the first book displayed warnings that violating the rationing rules and regulations could result in fines of up to $10,000 and 10 years of imprisonment. This was followed by a series of rules. The rationing book could only be used by the person to whom it was issued and if that person left the country or died, the book had to be surrendered back to the government. Any book found had to be returned to the OPA. 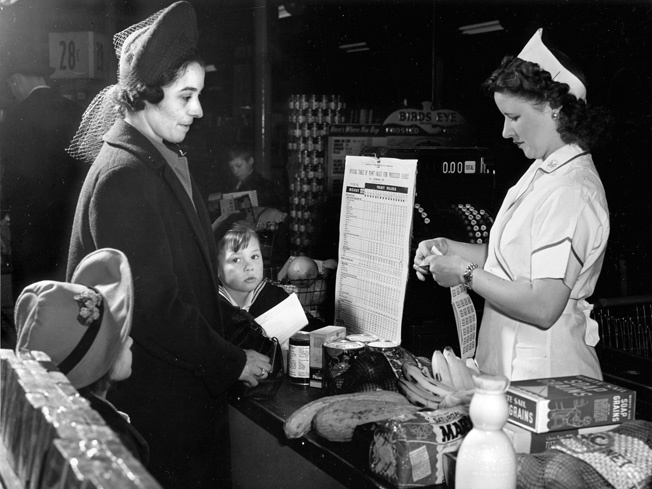 A shopper and her children watch as a clerk tears point stamps from a War Ration Book 2 to cover the processed foods being purchased. While rationing struggled along, more and more American workers were earning more and more money as defense and defense-related industries geared up for the massive war effort. However, there was less and less on which these workers could spend their money as meat, clothing, and other items became rationed and as quotas were set for their production. More and more dollars began competing for fewer and fewer new consumer goods as more production was shifted away from the civilian market and into the war effort. New radios, refrigerators, and stoves started to vanish from stores as tanks and airplanes began to roll from assembly lines. The rationing rules became comprehensive. The government seemed on track except in the most critical area, gasoline. As summer arrived, even though the need was growing more desperate by the hour, the government had yet to define a nationwide gas-rationing policy. Roosevelt was in trouble and he knew it, but luckily he was handed a way out when Congress decided to “go it alone” and passed Iowa Senator Guy M. Gillette’s bill to establish a “Rubber Czar” whose job would be to head a special organization that would be independent of the War Production Board. This civilian agency would be charged with overseeing and coordinating the war economy. The bill creating the czar had been shoved through Congress by the farm bloc and its real purpose was to force synthetic rubber to be made only from agricultural and forest products. Roosevelt knew that he could not let this bill become law—he could not allow two organizations, one frankly biased toward the farm bloc, to struggle against each other with America’s war economy as the prize. He knew he must stop this bill from becoming law or risk critical damage to America’s war production machinery; thus he vetoed the bill, but did it in a way that rather elegantly got him off the hook. In his veto message he announced the formation of a completely reliable and impartial fact-finding commission to thoroughly examine rubber, oil, and gasoline rationing in great detail. Sears noted that Roosevelt, “in one neat maneuver, had side-stepped, gotten out from under, and passed the buck” on gas rationing. Nevertheless, Roosevelt desperately needed a man who had unquestionably earned the nation’s complete trust and respect to run this committee. Fortunately for both Roosevelt and America, there was such a man. He was Bernard Baruch, the 72-year-old “Park Bench Statesman,” the wealthy “Wall Street Whiz” who had been a presidential adviser, first to Woodrow Wilson during World War I, and then, between the two world wars, to Presidents Harding, Coolidge, and Hoover. Now, he would advise Roosevelt (and Truman after the war). In an article, “Three Men on a Bench,” in Time, August 17, 1942, Baruch is described as a man with a “white-topped frame … long legs and [wearing] the inevitable high black shoes.” Baruch liked to confer with officials on a bench in Washington’s Lafayette Park because the park provided privacy and a relaxed atmosphere, thus he became known as the “Park Bench Statesman.” The “Three Men” in the article’s title referred to Baruch and his two fellow committeemen, James Bryant Conant, the president of Harvard University, and Karl Taylor Compton, president of the Massachusetts Institute of Technology. In no uncertain terms, Roosevelt was warned that America could lose the war if he took no action and continued to allow various pressure groups to continue unchecked in their greed and total self-interest. Roosevelt got the message: He ordered full gas rationing to begin on December 1, 1942. He also ordered a ban on pleasure driving, as well as a 35-mile-per-hour speed limit on all of America’s highways. 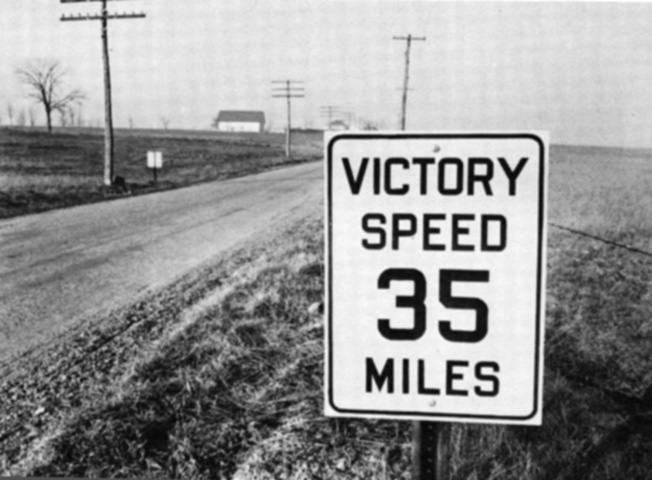 Reducing the speed limit to 35 mph saved both rubber and gas. In this, as with other items, the rulings of the OPA were all-powerful though they were very often furiously appealed. Nevertheless, the bottom line for the nation as a whole was that the “Park Bench Statesman” had pushed Roosevelt into finally taking the action he knew he had to take. The B-sticker holder had some essential driving to do and received a supplementary allowance based on that need. The C-sticker driver also needed the car for essential driving (such as a physician making house calls) but was allocated all the gasoline needed. There was also a T-sticker for truck drivers, who also could get all the gas they needed. Taxi drivers and farmers had their own stickers. Gas rationing quickly faced serious difficulties because the government did not take into account the personalities of many American drivers—personalities that expressed themselves through a mass influx of A-sticker drivers flocking to their local rationing boards with the most absurd reasons for demanding that their A-stickers be upgraded to B- or C-stickers. The gas ration sticker somehow had become a status symbol and many drivers argued furiously to have their A-sticker upgraded. Crime was also a serious problem throughout the nation at that time. Ration books and stamps were regularly stolen, even from OPA offices. Counterfeiting grew into a real problem as both ration books and stamps were regularly forged. Some of this forging was of excellent quality as “top professionals” expanded their efforts from the counterfeiting of money to the excellent counterfeiting of ration books and stamps. 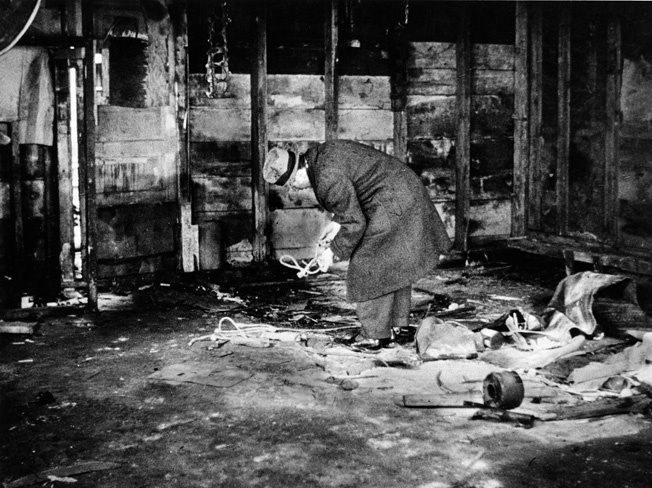 An inspector looks at evidence of a Black Market meat operation in a filthy building. The black marketeers spread lime on the floor in a poor attempt at cleanliness. A significant black market was another problem, with, for the most part, the black marketers selling meat, sugar, and gasoline. The demand for black-market gasoline was significant enough to cause armed criminals to attempt to hijack trucks on solitary roads; many drivers started carrying guns. $1.00 in 1942 had the same buying power as $1.06 in 1943. $1.00 in 1943 had the same buying power as $1.02 in 1944. $1.00 in 1944 had the same buying power as $1.02 in 1945. Using 1942 as a base year, inflation ran at six percent in 1943, and then remained lower and constant at two percent in 1944 and 1945. Although the rationing system was widely hated and often abused, it worked. The massive American military machine rarely lacked for any essential item. Tags Allies, Bernard Baruch, Big Inch, Executive Order 8875, Franklin D. Roosevelt, Homefront, Office of Price Administration (OPA).